Power Test Analyzer adopt several electronic design solutions, in example configuration to work with mono (v. Lite) or bridge power amplifier (v. PRO), implementing a full balanced power circuitry. Particular attention is paid to environment during all engineering phases, reducing impact selecting materials and coatings, optimizing cooling with thermo-fluid simulations, realizing a Full Power OFF Switch, or inactivity auto power off. This proprietary circuitry benefit of remote power off as a relay, but with a complete power off as a mechanical switch (no standby, no active led, zero voltage inside transformers and PCB). The product is compliant in advance to requirements on power consumption requirements for the OFF state as defined by the European Regulation n.1275/2008 on Ecodesign, valid from 2014 on. Internal Noise Source is generated around a new technology µC based, the firmware code is in accordance with Central Limit Theorem to obtain Gaussian distributed noise. Web Manager has a plug-in code able to detect and automatically adapt screen resolution of every connected client, permitting to obtain a perfect visualization on PC, Notebook, PDA and Smartphones. Phase Plug Support software is an extremely intensive numerical application. The program contains hundreds of numerical mathematics algorithms, some of which are extremely large, special routines place relate low demands on the CPU's floating point performance. 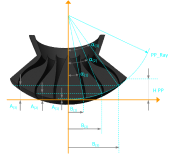 Horn.ell.a implement inside a process for 3D horns calculus, design and rendering. Environment information are important to final result of expected frequency response, experimental prototypes are used for frequency correction. The same process is then transfer to PPS software. Selecting x,y points number you can decide element size for model mesh precision and the amount of exported data.